Last updated on: 15th February 2019.
and during the year we have received approx. £250 in donations. The proposed game in September had to be cancelled because of a clash of dates, but arrangements are in hand for a 8 rink game on the 4th February 2019 at Melt Mowbray Indoor Bowls club. A team representing the Charity Trust will play a team captained by Bill Smith Bowls England President. Match fee will be £12 including an after game meal. Anyone wishing to enter a team please contact Jessie Clark. Charity Game 21st January 2017 at Gedling Indoor Bowls Club in Nottinghamshire. The Annual indoor match was held on the 21st January at Gedling IBC Nottingham, between a team Captained by the Chairman of the English Indoor Bowls Association and a team from the Charity Trust. The arrangements with Gedling IBC were made by Chris Smith a Past President of Bowls England and everyone received a very warm welcome, with a splendid match meal at the conclusion of the game. Amongst those enjoying the game was Michael Andrew President of EIBA, Mike Cohen Junior of EIBA and Maurice Mays Past President and Gillian Wonnacott Chairman of the EIBA Board. Other teams came from Lancashire, Bedford, Nott’s WIBA and BE Disability together with many local players. The afternoon raised £415 towards the Trust funds and hopefully raised the profile of the Charity with bowlers in the north of the country. Charity Game 19th September 2016 at Topsham Bowls Club in Devon. Continuing our practice of holding two fund- raising Charity Matches per year. 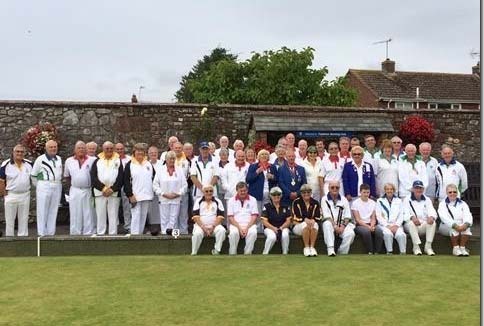 Topsham Bowls Club in Devon agreed to host a match between a team arranged by Michael Jennings, the Bowls England President and a team arranged by the Trust. The club hospitality was excellent, as was the match meal provided by Carol Organ. 48 players enjoyed themselves in a fun game with serious overtones of lollipops, in a light drizzle which continued most of the afternoon. The result was a small win to the Trust but it was the game of bowls that actually won the day. All touchers were rewarded with a small lollipop and it was extraordinary how many there were in the afternoon; so many that the lollipops ran out!!!!!. The Sum of almost £500 was raised for the Trust, which was the real result of the game and it gave an opportunity to raise the profile of the game by giving a captive audience an idea of the work that the Trust can do. Plans are underway for a game in Nottingham in January 2017 and in Leamington in September 2017. Charity Game 17th September at Burnham Bowls Club Buckinghamshire. In accordance with the Trust’s practice of holding two charity matches each year, one outdoors and one indoors, a match was arranged between Marcia Dunstone, Bowls England President, and the Charity Trust. The President’s team consisted of teams from Bedfordshire, Hertfordshire and her own club Berkhamsted. The Charity was represented by teams from London Irish, London Welch, London Secretaries, Middlesex, Bucks Umpires and a four skipped by Joan Balding Past President Bowls England. The weather was good and splendid afternoon concluded with a four course meal. A total of £601.40 was raised. The match was won by the President. These games are organised to raise funds but more importantly to spread the message that the Trust is there to help bowlers and their dependants. Applications, which are dealt with in strict confidence, can be made direct to the Chairman Jessie Clark. Notices in both the Bowls England’s and English Indoor Bowling Assn Limited’s handbooks give contact details. A date for diaries, a game has been arranged for September 20th 2016 at Topsham Devon, and a date is being sought indoors during this winter. We held a successful Charity match at Barwell IBC nr Hinckley on Saturday 23rd. A team was organised between the Chairman of The EIBA Ltd and a Charity team. The Charity teams were drawn from Leicestershire, Warwickshire, Northampton, Umpires, Bedford and some Trustees; everyone enjoined themselves.